NEW YORK (CNNfn) - Call it the $1.755 trillion dot.com investing lesson. It's hard to think of a publicly traded Internet company that is not down at least 75 percent from its 52-week high and that hasn't trimmed its expenses or laid off workers. While industry groups have always drifted in and out of favor on Wall Street, it's rare to see an industry evaporate as quickly and completely as Web stocks did. CNNfn.com asked the market data and research firm Birinyi Associates of Westport, Conn., to calculate the market value of the 280 stocks in the Bloomberg US Internet Index at their respective 52-week highs and their current market value. The combined market values of the 280 stocks had fallen to $1.193 trillion currently from $2.948 trillion at their peak, a loss of $1.755 trillion, most of which occurred between March and September of this year. The Bloomberg Internet Index contains Web retailers, Internet infrastructure firms, Web advertising companies, Web portals and makers of networking equipment. Some of the largest losses on a dollar-value basis came from networking equipment giant Cisco Systems (CSCO: Research, Estimates), which has lost $210 billion in market value from its peak; the Internet incubators CMGI (CMGI: Research, Estimates) and Internet Capital Group (ICGE: Research, Estimates), which have lost a combined $100 billion from their apex; the Web portal Yahoo! (YHOO: Research, Estimates), which shed $102 billion, and America Online (AOL: Research, Estimates), which is worth $92 billion less than at its highest point. Of the 280 stocks in the index, 79 are down 90 percent or more from their 52-week high. Another 72 are down 80-89 percent. Only five are down less than 5 percent. "It's not a correction � it's a crash," said Fred Wilson, managing partner at Flatiron, a New York-based venture capital firm dedicated to investing in the digital economy. The collapse of the Internet bubble, perhaps one of the largest financial fiascoes in U.S. history, came after a three-year period, starting in January 1997, when investors would buy almost anything even vaguely associated with the Internet, regardless of valuation. Investors ignored huge current losses and were willing to pay 100 times expected earnings in fiscal 2002. They were goaded by bullish reports from sell-side securities analysts� and market forecasts from IT research firms, such as IDC, Gartner and Forrester Research. "The venture business is all about excess and then correction," said Steve Bengston, a managing director at PricewaterhouseCoopers in San Jose, Calif., who advises early-stage companies. "It's like disk drives in the 1980s, when venture capitalists funded 50 disk-drive makers when the world needed three." "Stocks that skyrocketed north in a fashion never seen before will plummet south in a fashion never seen before either," Bengston added. "A lot of companies that don't have path to profitability or a leading position in their market will be shut down rather than receiving second or third rounds of funding." "When there were not very many Internet companies, the supply of Internet companies to the market was small and the appetite for them was large," said Flatiron's Wilson. "Therefore, if you were in the business of creating Internet companies in 1996-98, you had a market that provided massive demand for that." When public markets became glutted with new, money-losing Web companies in 1999, that picture changed rapidly. Venture funds are very reluctant to sink more money into struggling privately held Web companies that would be difficult to take public. Most industry sector booms, such as the biotech bubble of 1991, feature a large volume of IPOs in the hot sector, with the highest quality companies being the first to go public and the quality of offerings degrading as the boom reaches its later stages. The Internet bubble was no exception to that trend. Yahoo!, considered to be one of the highest quality, most blue-chip Internet stocks, went public in April 1996, becoming one of the first to trade in public markets. Amazon.com (AMZN: Research, Estimates), the giant of Web retailing, went public in May 1997 � still early in the cycle. According to the New York-based securities data firm Commscan, Web companies raised a total of $1 billion in 34 IPOs in 1997, rising to $2 billion in 45 deals in 1998, and then exploding to $24.1 billion in 292 IPOs in 1999. Investors who bought Web IPOs early in the cycle are still sitting on large gains. The combined market value of the 34 companies that went public that year is 330 percent higher than their offering prices, even after this year's Internet stock plunge, according to Commscan. The collapse of the dot.com bubble has resulted in bad news about layoffs or losses being issued almost every day. 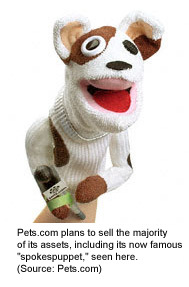 On Nov. 7, for example, Pets.com (IPET: Research, Estimates), an online pet-supply retailer that had spent millions promoting its brand, decided to shut its doors and laid off roughly 255 of its 320 employees. One day later, Internet Capital Group said that it plans to cut its staff by 35 percent and take a fourth-quarter charge of $25 million to $30 million in a move to strengthen its financial position. ICG cut back its new investments in the third quarter to $120 million, from $417 million in the previous quarter. The announcement caused ICG's stock to plunge $5.06 to $11.19 Thursday; it's now down 95 percent from its 52-week high of $212. The high rates of consolidation and failure that Web companies are going through now is typical of many newly emerging industries throughout American economic history. Whenever a new technology comes along that has the potential to dramatically change the competitive landscape, hundreds of companies are formed to try to exploit that opportunity, including many with weak management or poorly thought out business plans. Intense competition ensues, returns on capital fall, and most of the new entrants either merge or go bankrupt. The consolidation of the U.S. railroad industry in the 20th century shows this pattern. In 1929, there were 163 "Class I" railroads in the U.S. Today, there are seven Class I railroads remaining, and they carry more than 90 percent of the rail freight in the U.S., according to the Association of American Railroads in Washington, D.C. The Penn Central Railroad was formed from 600 previously independent railroads. Merrill Lynch analyst Henry Blodget, one of the leading bulls on Web stocks, warned about a shakeout in the Internet industry in a 330-page report issued last June. "As the shakeout continues, we continue to believe that the Internet spoils will go to the few, not the many," Blodget wrote. "As one investor we respect put it, anytime a new industry emerges, many turtles hatch, few make it to the sea." There were about 300 public business-to-consumer Web companies trading last June, only five of which were profitable at that time. Blodget believes that in three years, only 15-20 will be profitable. While high rates of consolidation and failure among Web stocks aren't at all surprising, the speed and severity of those failures has caught some investors off guard. Businesses that launched and operated at Internet speed have failed at Internet speed. For example, the name-your-own-price Web discounter Priceline.com (PCLN: Research, Estimates) went from $94 per share to less than $4 per share within the space of eight months.� PaineWebber began coverage of Priceline last January with a "buy" rating and a 12-month price target of $95, saying that Priceline "is truly revolutionizing commerce as we know it, providing a way for sellers to dispose of unwanted product while maintaining the integrity of their existing price structures." Web-based retailers and Web sites supported by advertising revenue have proven to be the two most failure-prone types of Internet business, and there are lessons to be learned from each segment. Web retailers underestimated how much infrastructure they would have to build and how much logistics work they would need to do to duplicate traditional brick-and-mortar retailers. Companies that were supposed to be "virtual operations" ended up with warehouses and inventories almost as large as those of traditional retailers. Amazon.com (AMZN: Research, Estimates), for example, held about $164 million of inventory and had more than $350 million in property, plant and equipment as of Sept. 30. "I don't see how Amazon is really a dot.com," said Anitesh Barua, an assistant professor at the University of Texas at Austin, who has done an extensive study of the Internet economy. "It's really a very traditional operation, and it's not Amazon's fault, since the publishers that supply Amazon can't operate in a virtual mode themselves." "Dot.coms aren't good at logistics," Barua added. "How can they be? They have been in business for only three or four years." In some cases, Web retailers have found that customer-acquisition costs were much higher than they anticipated. And, to make matters worse, traditional retailers have launched their own Web operations and proven to be formidable competitors. "The legacy retailers are really waking up and going after the Net big time, so the competitive landscape has changed for the pure dot.com companies," said PricewaterhouseCoopers' Bengston. "Huge venture funds have been formed to help traditional companies create Web operations." Finally, businesses that are narrow margin in the brick-and-mortar world, such as books and consumer electronics, have proven to be narrow margin on the Web too. Amazon had about $638 million in revenue in the quarter ended Sept. 30; after deducting its cost of goods sold, marketing and selling expense, and general and administrative expense, only about $3 million is left over. With the exception of about 15 major Web destinations, Web sites supported by advertising are fighting for their lives and, in many cases, losing. The IT research firm Jupiter Research estimates that $3.5 billion was spent on Web advertising in 1999, rising to $5.3 billion this year and expected to hit $7.3 billion in 2001. While that growth rate is much faster than competing forms of advertising, most of the advertising dollars are going to a few large sites, leaving thousands of smaller sites to starve. According to Charles Buchwalter, vice president of media research at AdRelevance, an Internet advertising tracking firm, 80 sites comprise 80 percent of all the hosted advertising on the Web. "There is a gradual move away from concentration, but the numbers still are really small," Buchwalter said. "The ebullience that many companies had 12 months ago has been disabused by now. Advertisers have found that branding plays a role and coming up with a business model in this new world is not a slam dunk." While the plunge of the roughly 300 publicly traded Internet companies has generated a substantial amount of press coverage, those companies and the layoffs they have made represent only a tiny percentage of the overall Internet economy. Most of the Internet economy consists of old-line industrial companies that are using the Web to trim billions of dollars in costs from their operations and better serve customers. It also includes networking equipment companies that have generated billions of dollars in profits selling the routers, hubs and switches needed to direct the exploding amount of traffic over the Internet. "There is still a Gold Rush mentality out there, and the companies selling the pickaxes and dynamite are the ones who are consistently successful," said Matt Stamski, a senior analyst at Gomez Advisors in Lincoln, Mass., referring to the networking companies. According to the human resources consulting firm Challenger Gray & Christmas Inc., some 22,267 dot.com job cuts have been announced since December 1999, when the firm began tracking such data. Of the 274 companies tracked from December 1999 through October 2000, 44 of them -- or 16 percent of the total -- have since failed. Still, people fired from dot.coms should have no problem finding another job, said John Challenger, the company's CEO. "I think companies will spend billions of dollars over the next several years building their e-commerce structures, and these dot.com employees will be leaders in helping them do that," Challenger said. "A handful of highly publicized dot.coms are failing," said the University of Texas' Barua. "They never employed that many people to begin with, so the displacement is quite small. Sure, it's unfortunate for the investors who lost money, and the people temporarily being laid off. Their dreams of becoming multi-millionaires overnight just got shattered." "There are still an incredible number of opportunities that will get funded related to the Internet � they're just different," said PricewaterhouseCoopers' Bengston. "We're in the second inning of a nine-inning game. The Dells of the Internet business have not even been founded yet." Still, risk-averse investors would be well advised to remember the turtles heading for the sea.